How Do You Decide Which Theme to Pick for Your Wedding? Not sure what to do for your wedding theme? The word “theme” isn’t used as much as it was traditionally back in the day. Today, it mainly refers to the general concept of how you want your wedding to look like. Whatever you decide will tie in with your invitations, floral arrangements, decorations, and just about everything else to make it all look cohesive. So how do you choose which theme to pick for your wedding? Here are a few useful strategies to help you. Where Will You Host Your Wedding? 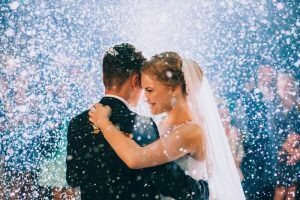 The location is one of the most important factors when it comes to deciding which theme to pick for your wedding. You’re probably not going to have a rustic, country theme set on a tropical beach (unless that’s something you’re going for). The location needs to make sense for your theme. So determining where you want to host your wedding will help you narrow it down. What Do You and Your Partner Enjoy? Another simple way to narrow down your decision process is by thinking about what you both actually enjoy. Maybe it’s the idea of a beach wedding in the tropics that excites you or an intimate setting in a quaint, vintage-style venue. Try to come up with some points that describe you as a couple and what your preferences are. Then go from there. If you haven’t been scouring Pinterest yet, you’re missing out! This online platform is full of so many creative and inspiring ideas, especially when it comes to all things wedding-related. Hop online, set up an account and start exploring some of the pins that can help you figure out what you like and dislike. If you have the budget for it, hire a wedding planner! If you’re already pressed for time with your busy schedule, a wedding planner can take that weight off of your shoulders. They can use their expertise to help you determine what you truly want, and then make it happen. When you’re on the hunt for the perfect wedding venue, consider Ottawa premier’s venue at St. Elias Centre. Whether it’s a small, intimate wedding or a grand one, our elegant and flexible venue can accommodate your needs. We also offer in-house catering from our Executive Chef, on-site parking with over 400 spots, and professional guest-related services to help with your wedding plans. Contact us today to learn more or to arrange a tour!